Ok! 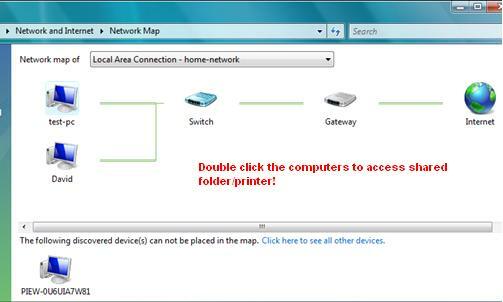 Here I will show you 3 simple ways to access shared folder or printer in Windows Vista, the access methods are easy and straight forward. Have a quick look! This is the straight forward method and also formal Vista method. 1) Go to Start and click on Network. 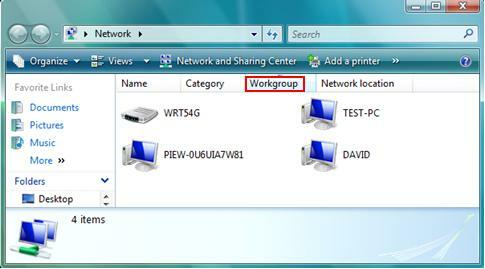 2) Network window will show you all computers in existing workgroup. You can then double click on the computer which you wish to access shared folder/printer. Note: You can click on Workgroup to access other computers in other Workgroup. Note: I noticed sometimes it might take up to 10-15 minutes for the XP computer to appear in this Network window. Too bad.. 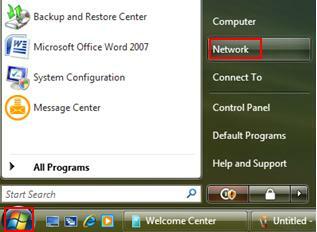 Note: You can also access the Network window in Network and Sharing Center by clicking View computers and devices. The other access method is double click on the computers that are shown in Network Map. If you know the IP address or hostname of the computer with shared folder/printer, type the command in following format in any explorer bar and then hit "Enter" button, you should then be able to access that computer. This access method works in other Windows OS as well. Note: This access method is good and useful if the XP computer is not shown in Network window. Return to top of "3 Simple Ways to Access Shared Folder or Printer in Windows Vista"! !